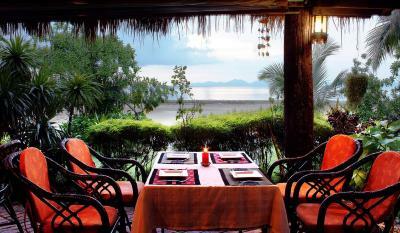 Lock in a great price for Krabi Sands Resort – rated 8.1 by recent guests! Lovely location near the beach. Was lovely to sit outside at breakfast with a view of the sea, watching the long tail boats. Close to the beach town and food. Far from the crowds. Chill like its 1960. Slience and calmness, clean, spacious, nice furnitured vacation houses, clean swimming pool, beautiful garden, close to beach with pleanty of good restaurants. Lovely helpful staff, in a quieter part of Krabi. Completely adorable dog called Mickey in their restaurant over the road. Restaurant was lovely, pool was beautiful. Location close to beach and restaurants. 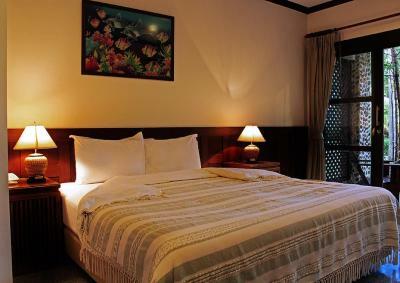 Peaceful resort, lovely pool area, clean and comfortable room. 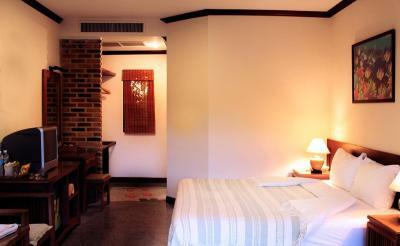 It is value for money hotel to feel away from everything. Nice quite area, nearby 7eleven, very nice lady at reception who provided whatever we need and non crowded silent pool area. 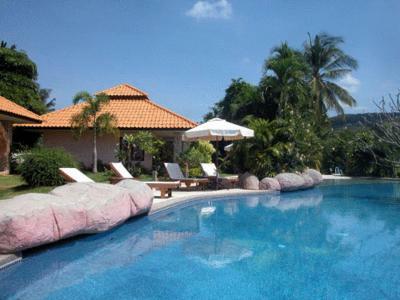 Nice resort with bungalows arranged around a pool. Roomy bedroom with a lovely terrace outside. 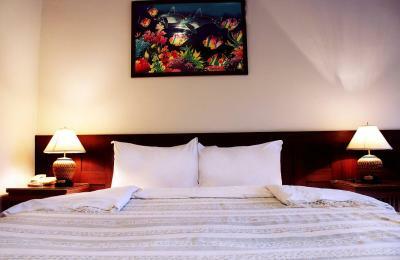 Great location with beach and various restaurants and shops all walking distance. There is a new 7-11 next door which is very handy and has a proper coffee machine. 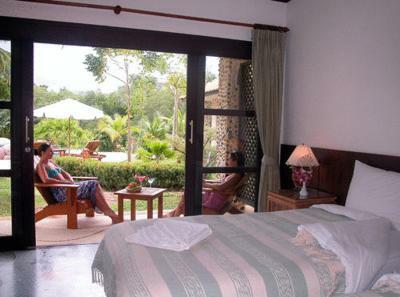 Very quiet and private rooms, the garden is beautiful and swimming pool looks absolutely lovely in the middle of the garden. Also nice cat family living there and my daughter was happy to play with them. Great and very nice staff. It’s a small but nice Resort incl. lots of lovely details. Value for money is really fine. The Restaurant is nice and food is great. Cute, charming, friendly staff always willing to go out of their way for you. Good breakfast on the beach. Surrounded by nature, peaceful and calming settings. Krabi Sands Resort This rating is a reflection of how the property compares to the industry standard when it comes to price, facilities and services available. It's based on a self-evaluation by the property. Use this rating to help choose your stay! The air-conditioned guestrooms come with wooden furnishings and are equipped with a satellite TV, tea/coffee maker and a fridge. Private balconies and bathroom amenities are provided. The large outdoor pool is chlorine-free and treated with saltwater to cater to guests with sensitive skin. Other facilities include car rentals and room service. 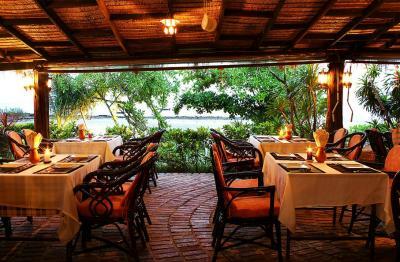 The on-site restaurant features beachfront dining and serves Thai and Western cuisines. Drinks and snacks are available at the pool and beach bar. 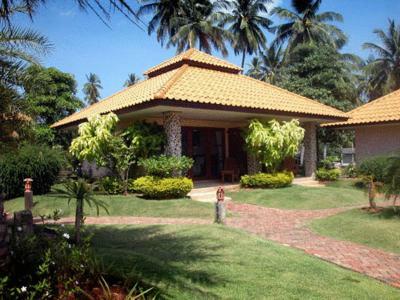 Krabi Sands Resort is approximately 22 mi from Krabi International Airport. 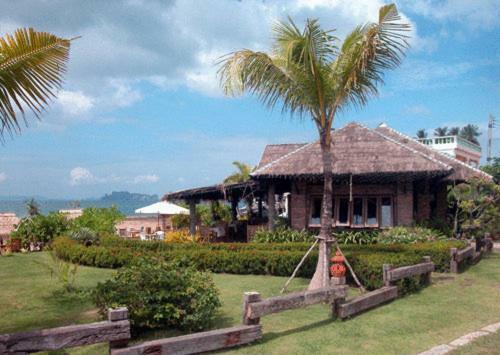 When would you like to stay at Krabi Sands Resort? 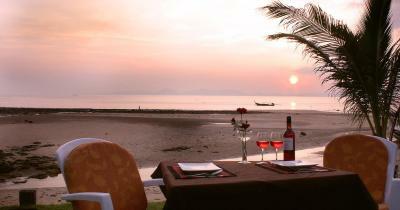 House Rules Krabi Sands Resort takes special requests – add in the next step! 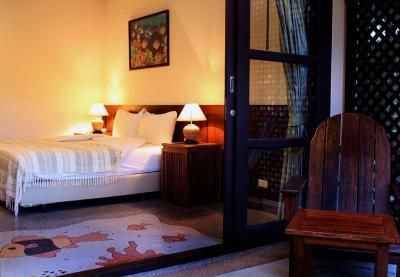 One additional older child or adult is charged THB 800 per night in an extra bed. Krabi Sands Resort accepts these cards and reserves the right to temporarily hold an amount prior to arrival. Very disinterested staff. No-one on reception to deal with check in so we had to go looking for someone in the restaurant over the road. The staff here, with the exception of the gardener and one receptionist we met on our last day, were the most unwelcoming that we came across in the whole of our time in Thailand. This really let down an otherwise lovely resort. Pool was amazing. Well situated. Breakfast could be better. I was happy to see one of days fresh salad, would suggest to keep it for everyday. Doors to terrace had gaps, i had concerns about mosquitos, bet they didnt bother us. 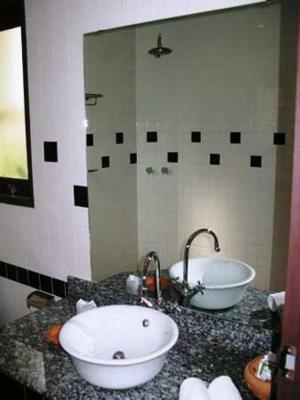 Bathroom was a little basic and dated compared to others we have stay in. Breakfast ok - lovely location but a little lacking in variety. Check in was a bit of a pain as no staff on duty when we arrived, and had to go and enquire in the restaurant across the road. Cleaning :( I dropped down my lipstick on the floor and found it absolutely dirty especially underneath the beds. We were family with child but only after third remainder they started to put 3 towels in the room. Note Beach: you should walk about 5 min to the left by the road. The shower pressure was a bit weak, but otherwise all was fantastic. Location could be better. You have to cross the Main Street to get to the beach. Direct beach is not really perfect. For this price fresh good coffee could be included for breakfast. We were wondering why the restaurant crew looked very sad. Being asked to pay immediately on arrival, before even looking at the room and before a proper "welcome". A few more smiles in the restaurant would not hurt. Would also appreciate real orange juice instead of the chemical concoction. Good breakfast otherwise, definitely nothing to complain about. Besides, I am getting tired of people who expect luxury service at 3 star hotels. If you want luxury - pay for it! 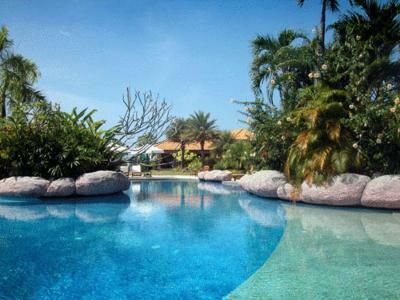 Lovely well kept tropical garden and pool! Good room. An old gardener who did a fantastic job. Jen in the reception was happy to help out with everything and always had a smile ready for us. The staff of the hotel (maids, gardeners, receptionist, night watchman..) generally really nice. 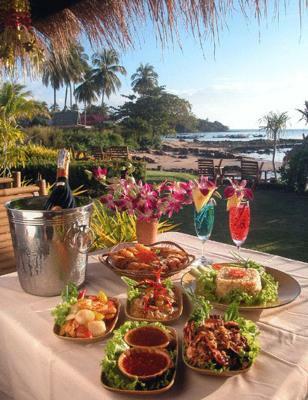 Location off the main tourist drag, nice beach shacks with good food a few minutes away. Sunset Bar had the best Pina Colada to enjoy at sunset. A road between the hotel and the beach, but that applies to all hotels in the area. Not at all disturbing inside the hotel area. Breakfast restaurant right by the beach. Excellent value for money. Weak lock: Doors can be opened by sliding both doors together to the side with little strength. Breakfast: very simple, different breads but nothing to put on. Only instant coffee powder... Cereals in little packs. Could be improved easily, with some tomatoes, cucumber, cheese & fresh coffee. Beach: you cannot really enjoy the beach right in front of the hotel. You have to go to Klong Muang Beach which isn’t far! The pool was nice and easy with 1yo. child. The bed was comfortable. Rooms were very clean. House keeping took well care of the room everyday. The garden area looks very well taken care of. Very quiet, Room was further away from the road. Many little restaurants right at the beach close to the hotel. 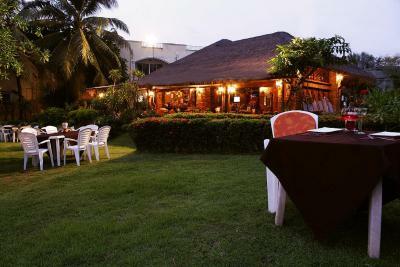 Recommending Bamboo Bar! Klong Muang beach was also a nice beach to spend your day at.